From Goodreads: For Cricket Thompson, a summer like this one will change everything. A summer spent on Nantucket with her best friend, Jules Clayton, and the indomitable Clayton family. A summer when she’ll make the almost unattainable Jay Logan hers. A summer to surpass all dreams. Some of this turns out to be true. Some of it doesn’t. When Jules and her family suffer a devastating tragedy that forces the girls apart, Jules becomes a stranger whom Cricket wonders whether she ever really knew. And instead of lying on the beach working on her caramel-colored tan, Cricket is making beds and cleaning bathrooms to support herself in paradise for the summer. But it’s the things Cricket hadn’t counted on–most of all, falling hard for someone who should be completely off-limits–that turn her dreams into an exhilarating, bittersweet reality. A beautiful future is within her grasp, and Cricket must find the grace to embrace it. If she does, her life could be the perfect shade of Nantucket blue. 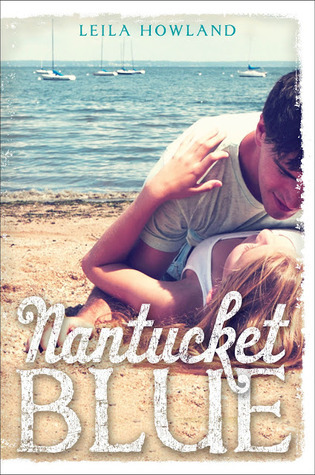 Nantucket Blue turned out to be just what I was expecting: beachy and romantic, a fresh take on mature contemporary YA. It’s similar in tone to the stories I write, and very much the type of book I enjoy reading. I adore its lovely, washed-out cover, and the fact that Jenny Han blurbed it, well… that says a lot. It took some time for protagonist Cricket to grow on me. She’s got a lot going on with her parents and her best friend, and at the beginning of the novel, she struck me as needy and rather dense. I never disliked her — her flaws made her feel like a fully drawn character — but at times they also made her a bit difficult to connect with. While Cricket always has the best of intentions, I think she comes into her own when she starts working at the Cranberry Inn. The friends she makes there (Liz and George in particular) help Cricket find confidence, at which point she becomes a protagonist who is easy to relate to, and a joy to root for. Cricket’s voice is definitely worth mentioning. It’s authentically teen without ever feeling like author Leila Howland is trying too hard. There are times when Cricket makes some truly excellent life observations, and times when she is genuinely funny. I love when a novel makes me laugh in public, and Nantucket Blue did on several occasions. I have two favorite things about Nantucket Blue. First, the setting. I have never visited Nantucket (or any of the surrounding areas) but obviously I need to. I adore small oceanside towns, and Leila Howland makes Nantucket feel positively magical. The sandy beaches, the specialty shops, and the quaint inns. The tasty food, the Fourth of July celebrations, the warmth and the water and the phosphorescence… Who wants to plan a writers’ retreat in Nantucket? Elana Johson invites you to her ABANDON release par-tay! And learn more about the Debut Author Challenge HERE. Oh, but I do love books that transport me to beautiful places. And a delicious romance is perfect for summer. I’ll have to check this one out. Thanks for the terrific rec, Katy. Fantastic review! I hope you get a chance to read it, Carol, and I hope you enjoy it as much as I did! This sounds so delightful–I can’t wait for a sunny day to read this on my porch! It’s probably the next best thing to actually visiting Nantucket, Erin. 🙂 Let me know if you end up enjoying it! Your first paragraph sounds exactly like what I’d say–I’ll need to add this one to the list! Yay! Hope you love it, Stephanie! ooooh, this sounds so good. I have been anticipating your review since you mentioned in a previous post or maybe showed the pic on instagram?– I’m getting my social media all mixed up. Anywho, it sounds SO perfect for summer. Now if only I could swing a vacay out to Nantucket and read it there. That would be ideal. So basically everything you said. Like you the setting was a big plus for me. I love these types of town…Cricket took also a while to grow on me but when she did, she didn´t let go. I loved the voice and the love interest? Major swoon! side of your story. It’s surprising you aren’t more popular because you certainly have the gift. is a excellent website that gives a lot of information regarding the particular issues included complete. demonstrating us all diverse facets to it. You should continue the good work. When i cant hold out you just read whats next. on to learn to read whats up coming.